Haere ra, e Tawa, i te ara o te pai! Hei whakarongo mai ma Kerei i te tonga. Na te toki o te po, ka hinga ki raro ra na! To mata i haea te uhi a Mataora. I karangatia a Taurua ki tera ingoa, Te Kuia Makutu; otira, ko tetahi o ona ingoa ko te Kuini, he rangatira no ona tupuna, he ngahau nona ki te wai korero i nga turanga o nga iwi ki runga. Kotahi tama e waiho ana e ia hei whakakapi mo tona turanga, ko Pita tona ingoa, he tangata whakaaro tika, ko ia ka whakaturia nei e te iwi kua pania nei i te matenga o Te Tawaroa. 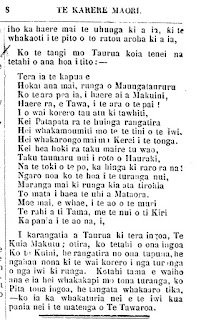 DEATH OF TAURUA TE TAWAROA. It becomes our painful duty to record the demise of the Cheftainess of the Patukirikiri tribe, residing at Coromandel. 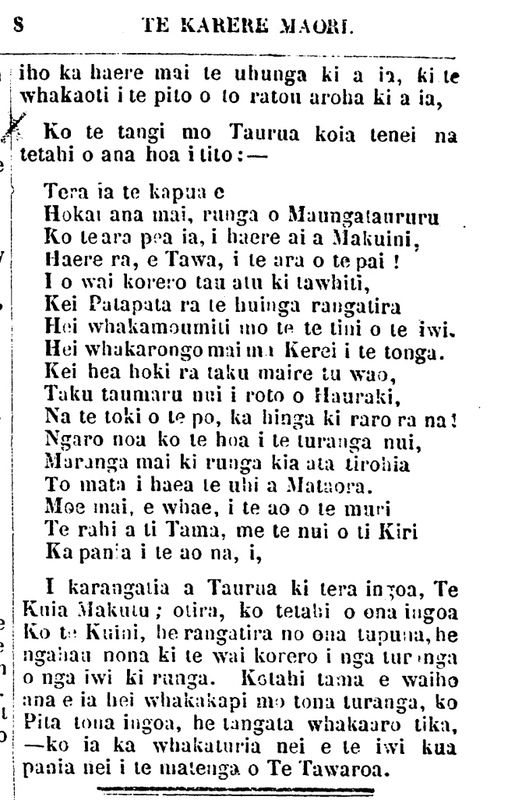 Taurua Te Tawaroa Makuini. Our lamented friend was one of the old Maori school, wedded to her native superstitions, owing to which we presume she was dignified by the appellation of the Old Witch, She was, however, most friendly to the European settlers, and manifested the greatest anxiety in regard to the cultivation of kindly relations between her tribe and the Government of the country. The writer has had frequent opportunities of noticing her conduct, and he feels happy in the reflection that all he knew of Taurua commanded his respect. At the great Coromandel meeting in reference to the gold question, the speeches of the aged chieftainess excited considerable merriment; but there were few in that assembly more willing to give up their lands to the Government on that occasion, than Taurua. The locality known as the Wynyard Diggings belonged to Taurua, and up to the time of her death not the slightest obstacle was offered to their working, nor any advantage taken of her novel position as Cheftainess of the Coromandel gold diggers. Taurua was highly venerated by the tribes of the Thames; and indeed her name was respectfully mentioned by remote tribes in various parts of the country. May be it was the path by which Makuini made her exit. Of thy great speeches has extended o'er the land. While the tidings were borne along to Grey, Far in the South. But where is now my Maire that stood So gracefully in forest shades? My covert, the covert of the people Thro' Hauraki's shores? The axe of death has felled it, and now it lieth low. The friend is absent now! But rise again and let us see thy face Marked with Mataora's chisel. While the tribes Ti Tama and Te Kiri Are in this world, motherless and sad. If Taurua was called the Old Witch, she was also called the Queen, in consequence of her rank and the active part she took in the public discussions of the Maori race. She leaves one son named Pita, a discreet young man, who is to be duly installed into the office of Chief of the bereaved tribe.